1 to 12. 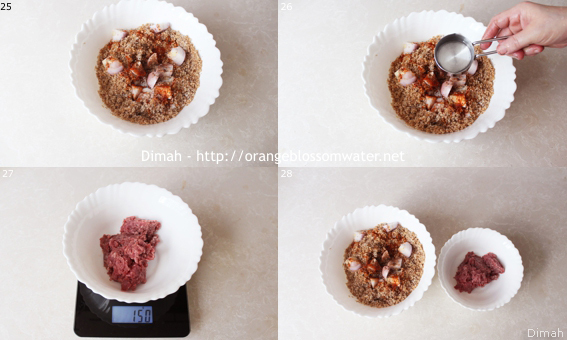 Measure 300 g fine brown bulgur wheat, and rinse it in three changes of water. 13, 14. 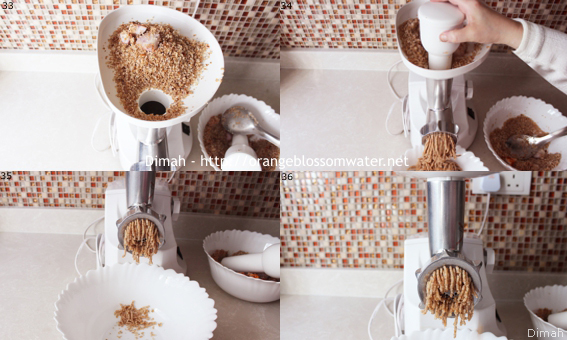 Put rinsed bulgur wheat in a bowl, and add 1/4 cup water to it. 15, 16. Cut 1 medium red onion into quarters. 17. 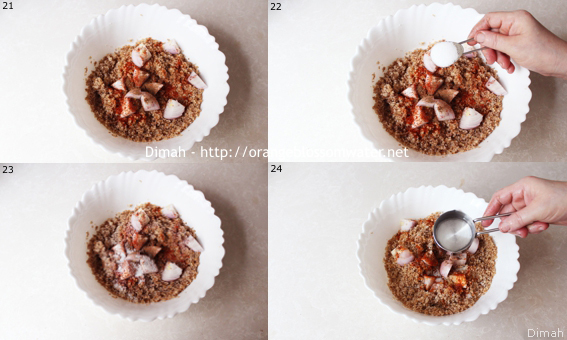 Add onion quarters to bulgur. 18, 19, 20, 21, 22. 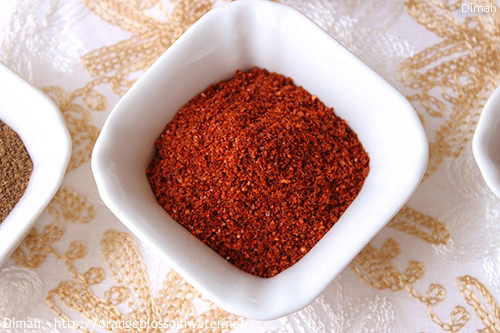 Add 1 teaspoon ground Aleppo pepper, 1/8 teaspoon al-bhar al-halabi (bahr al-daqqa al-halabi), and 1 1/8 teaspoon salt to bulgur. 23. Set aside in the refrigerator for 1 1/2 hours. 24. After 1 1/2 hours, add 1/4 cup water to it. 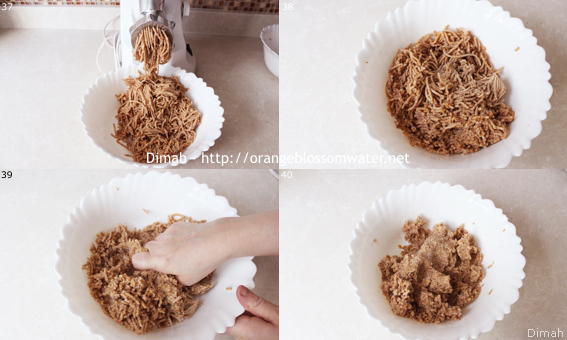 Test bulgur before you add this extra water, if it is moist so there is no need for the water. 25, 26, 27. 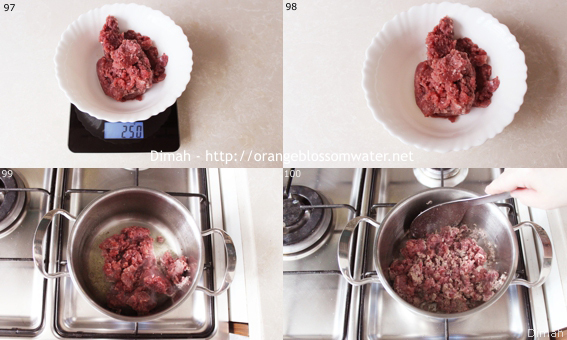 Measure 150 g fat free ground lamb meat, and set aside. 28. 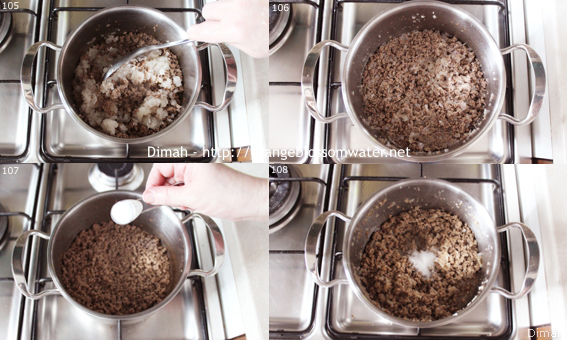 The Bulgur mixture and the meat will form kibbeh dough. 29, 30. Attach the fine holed plate to the meat grinder. 31 to 38. 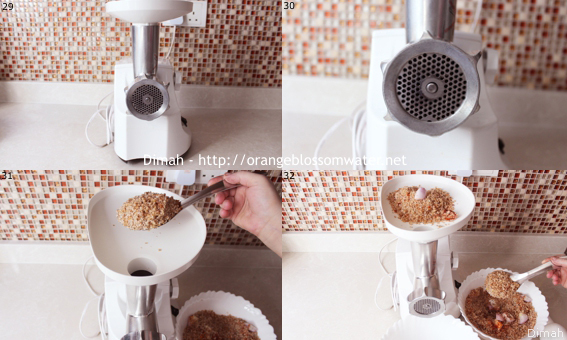 To the grinder, add bulgur and onion quarters, and grind. 39, 40. Knead the dough to bring together. 41, 42, 43, 44. Add the 150 g fat free ground lamb meat to the dough, and knead to bring together. 45 to 50. Form the dough into small logs, and grind. 51, 52. Knead the dough to bring together. 53 to 60. Again form the dough into small logs, and grind. 61, 62, 63, 64. Knead the dough to form a ball. Cover with a plastic wrap and set aside in the refrigerator. 65, 66. In a pan, heat 1/2 tablespoon ghee. 67, 68, 69. 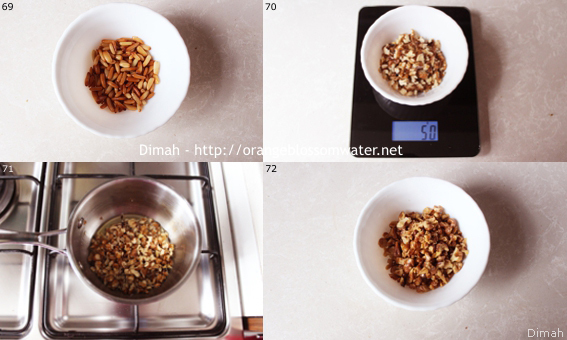 Add 30 g pine nuts and fry until golden brown in color, and set aside. 70, 71, 72. 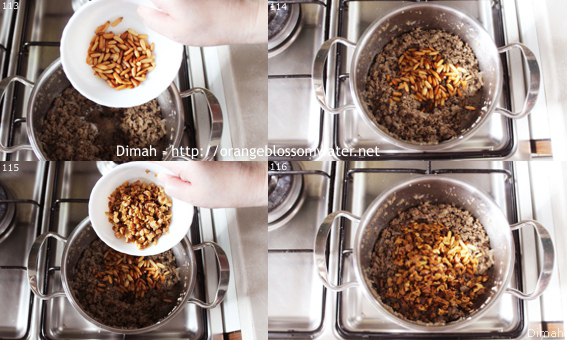 To same ghee, add 50 g chopped walnuts and fry until golden brown in color, and set aside. 73, 74, 75, 76. 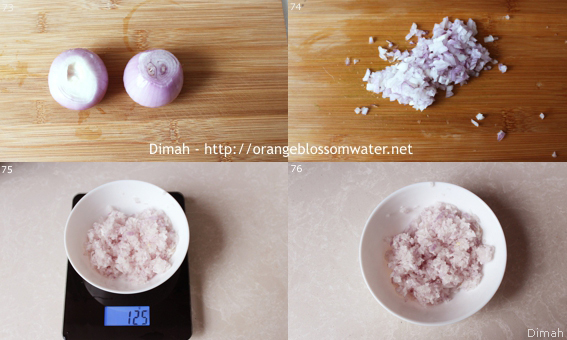 Finely chop red onion and measure 125 g chopped onion. 77, 78, 79, 80. 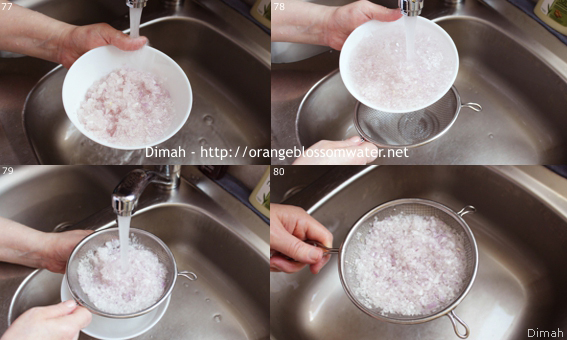 Rinse chopped onion in several changes of water, and put in a strainer. 81. Add 1/2 teaspoon salt to chopped onion. 82, 83, 84. Set chopped onion aside for 10 minutes to drain. 85, 86. 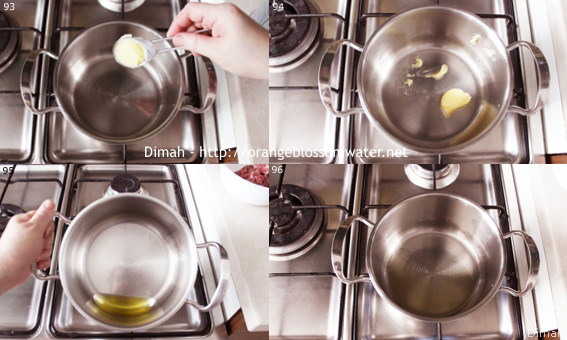 Press chopped onion to get rid of excess water. 87, 88. In a pan, heat 1 teaspoon ghee. 89, 90, 91, 92. Add chopped onion to ghee and stir to soften. 93, 94, 95, 96. In a deep pot, heat 1 tablespoon ghee. 97, 98, 99, 100. Add 250 g fat free ground lamb meat to ghee. 102, 103, 104, 105, 106. Add chopped onion to meat and stir. 113 to 120. Add nuts to meat, stir and transfer into a plate and set aside to slightly cool. 121, 122, 123. Bring kibbeh dough and knead. 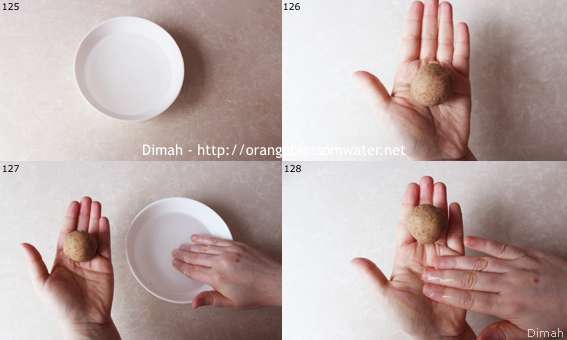 Divide it into balls, each ball equals to 30 grams. 104. Bring the filling (meat mixture). 125. 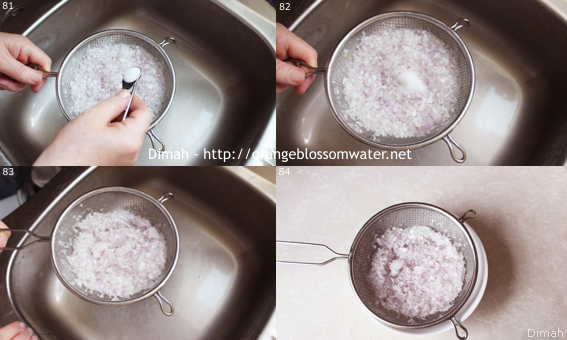 Bring a bowl of salted water, 200 ml water with 2 tablespoons salt. 126, 127, 128. 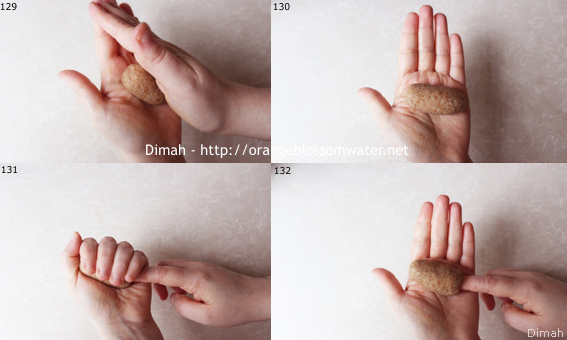 Take kibbeh ball, moistening your hands with water as you work. 129, 130. 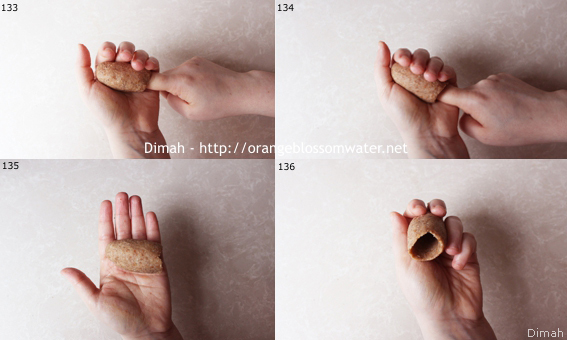 Roll the ball between your palms elongating it to form a 3 inch (7 cm) cylinder. 131 to 136. Hold the cylinder in one hand and insert index finger of other hand into center to form a hole. Gradually enlarge the opening and shape into a thin-walled shell about 1/8 inch thick (0.3 cm). 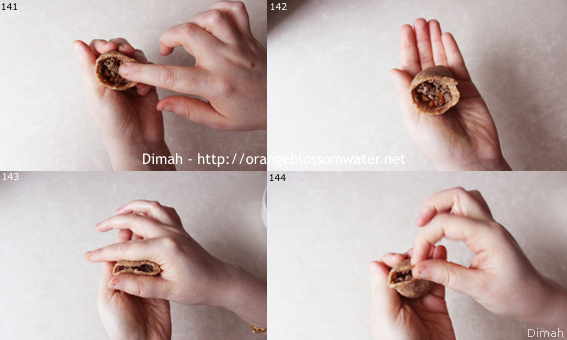 Mend any cracks in shell with a moistened finger. 137, 138, 139, 140. 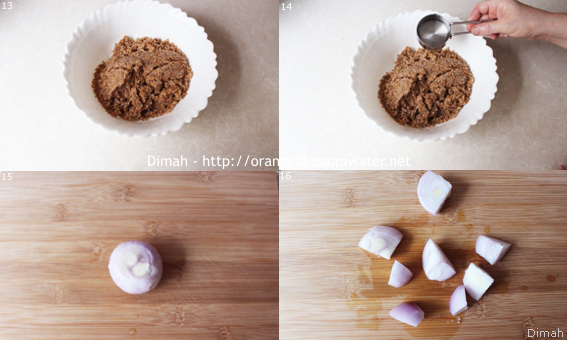 Once its right thickness, spoon in about a teaspoon of filling. It should be pretty full, but with enough room on top to close the opening. 141. Press the filling with your finger. 142 to 148. Moisten edges of opening. Bring the opening together at the top, making a point and seal the top. 149, 150, 151, 152, 153. Roll between your palms to smooth it. 155, 156. 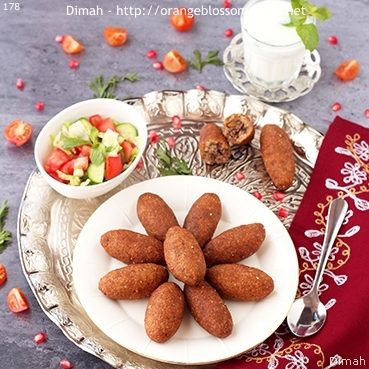 Put kibbeh on a plate, and always keep it covered with a damp cloth. 157, 158. Repeat the process with all the pieces. 159, 160. 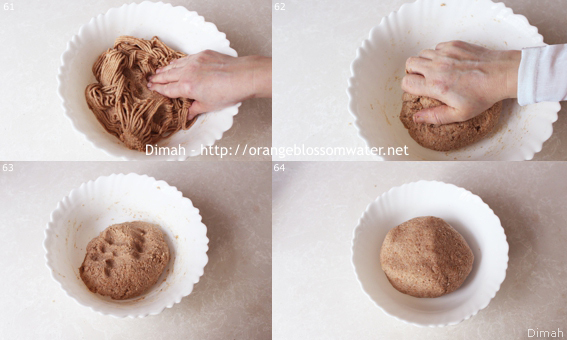 Keep Kibbeh covered with a damp cloth. Either you may fry it immediately or it can be kept in the refrigerator for a few hours but should be also kept covered with a damp cloth. 161, 162. 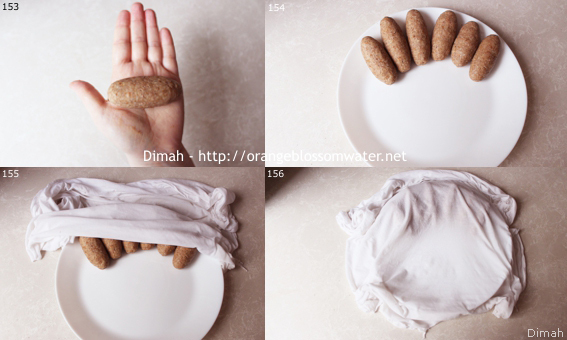 Line a plate with paper towels and set aside. 163, 164. 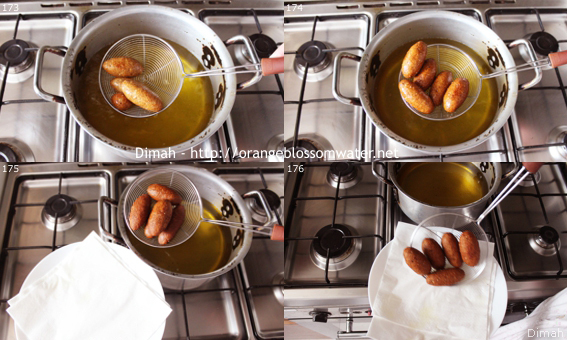 Fill a deep pot with a mixture of 1400 ml corn oil plus 200 ml olive oil. 165, 166, 167, 168. Heat oil until it reaches 325 °F (162 °C). You can test it with cooking thermometer or by throwing a piece of bread in to see if it sizzles. 169 to 176. 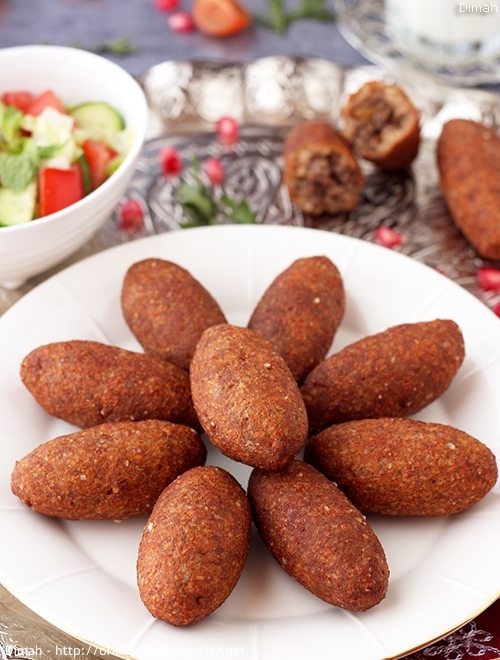 Fry kibbeh in batches. 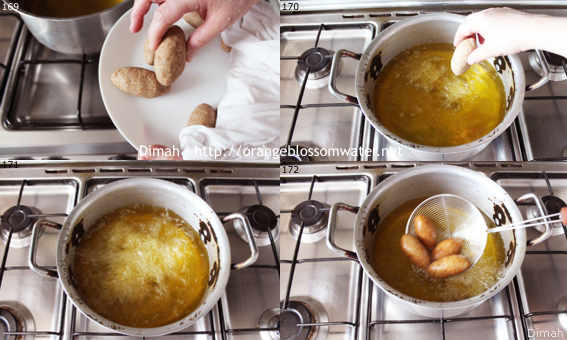 Turn occasionally when kibbeh start to float on the surface of the oil. Fry until the outer shell is dark golden brown and cooked through. 174, 175, 176. 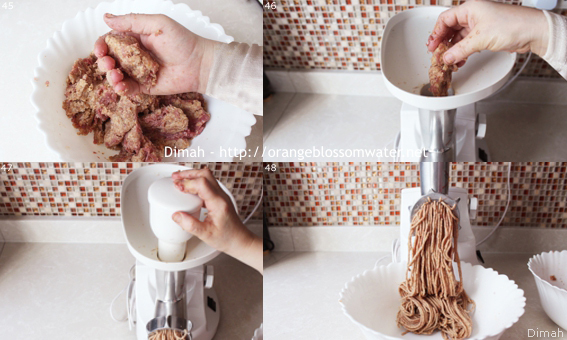 Drain fried kibbeh on paper towels. 177. Transfer into a serving plate, and serve. 178. 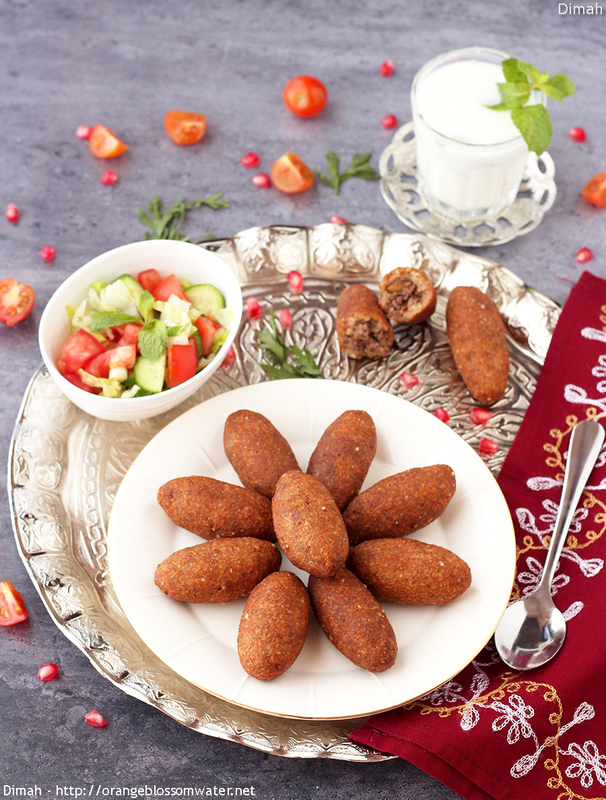 Serve kibbeh hot with salad (salad is prepared from tomato, cucumber, lettuce, mint, onion, lemon juice, olive oil and salt), and laban ‘ayran (yogurt diluted with water and seasoned with salt). 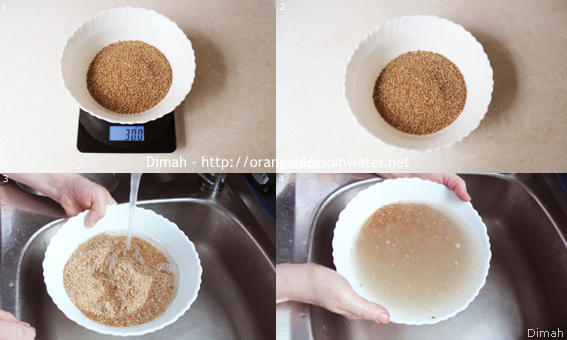 Measure 300 g fine brown bulgur wheat, and rinse it in three changes of water. 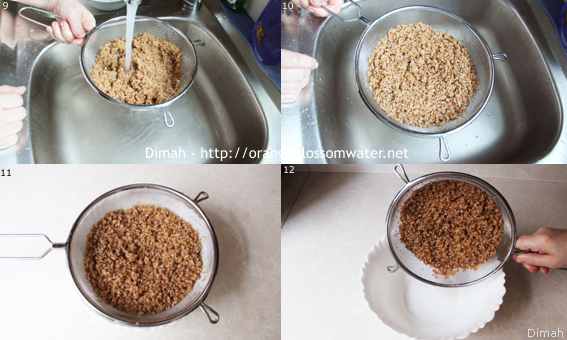 Put rinsed bulgur wheat in a bowl, and add 1/4 cup water to it. Cut 1 medium red onion into quarters. 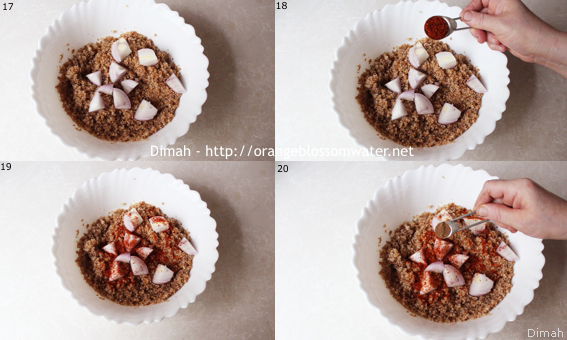 Add onion quarters to bulgur. Add 1 teaspoon ground Aleppo pepper, 1/8 teaspoon al-bhar al-halabi (bahr al-daqqa al-halabi), and 1 1/8 teaspoon salt to bulgur. Set aside in the refrigerator for 1 1/2 hours. After 1 1/2 hours, add 1/4 cup water to it. 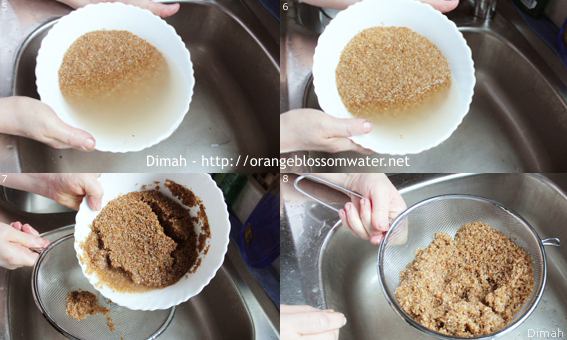 Test bulgur before you add this extra water, if it is moist so there is no need for the water. 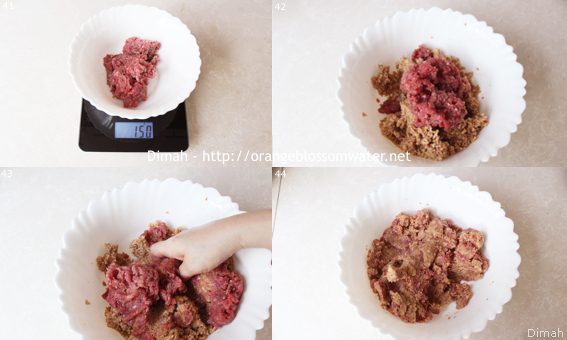 Measure 150 g fat free ground lamb meat, and set aside. 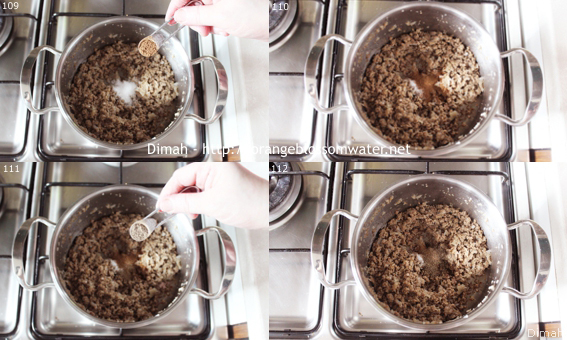 The Bulgur mixture and the meat will form kibbeh dough. Attach the fine holed plate to the meat grinder. To the grinder, add bulgur and onion quarters, and grind. Knead the dough to bring together. Add the 150 g fat free ground lamb meat to the dough, and knead to bring together. Form the dough into small logs, and grind. Again form the dough into small logs, and grind. Knead the dough to form a ball. Cover with a plastic wrap and set aside in the refrigerator. In a pan, heat 1/2 tablespoon ghee. 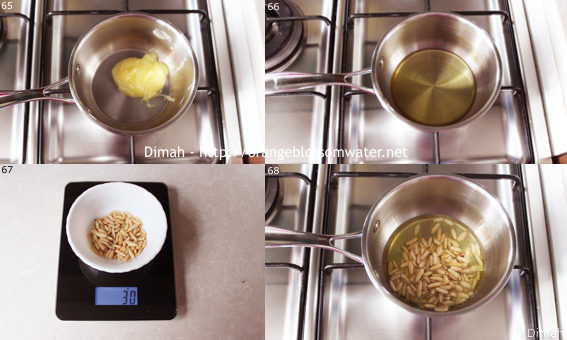 Add 30 g pine nuts and fry until golden brown in color, and set aside. 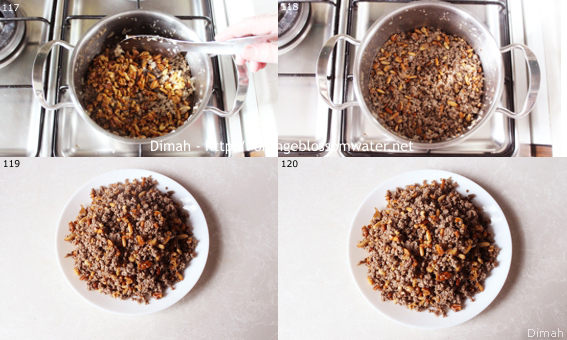 To same ghee, add 50 g chopped walnuts and fry until golden brown in color, and set aside. Finely chop red onion and measure 125 g chopped onion. 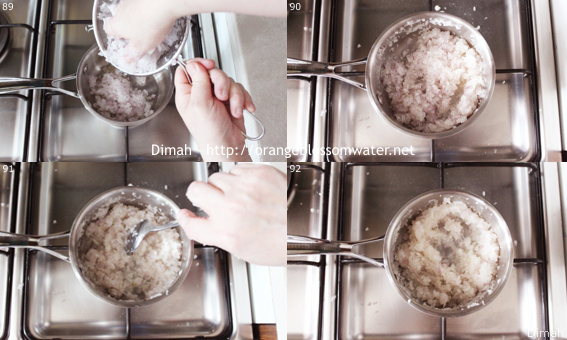 Rinse chopped onion in several changes of water, and put in a strainer. Add 1/2 teaspoon salt to chopped onion. Set chopped onion aside for 10 minutes to drain. Press chopped onion to get rid of excess water. In a pan, heat 1 teaspoon ghee. Add chopped onion to ghee and stir to soften. In a deep pot, heat 1 tablespoon ghee. 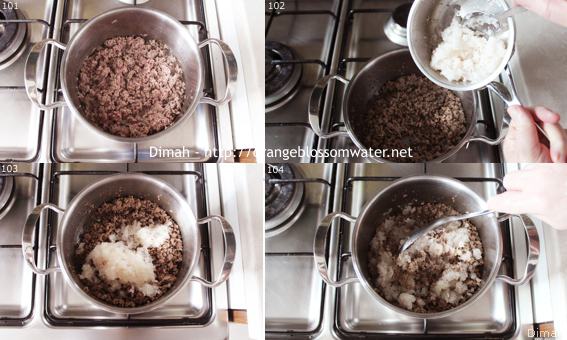 Add 250 g fat free ground lamb meat to ghee. Add chopped onion to meat and stir. Season the meat with 1 1/8 teaspoon salt, 1/8 teaspoon al-bhar al-halabi (bahr al-daqqa al-halabi), and 1/8 teaspoon black pepper. Add nuts to meat, stir and transfer into a plate and set aside to slightly cool. Bring kibbeh dough and knead. 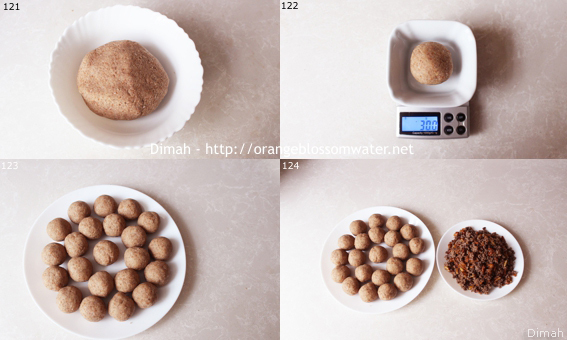 Divide it into balls, each ball equals to 30 grams. Bring the filling (meat mixture). 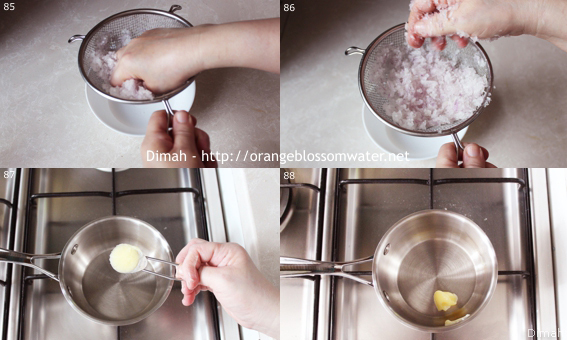 Bring a bowl of salted water, 200 ml water with 2 tablespoons salt. 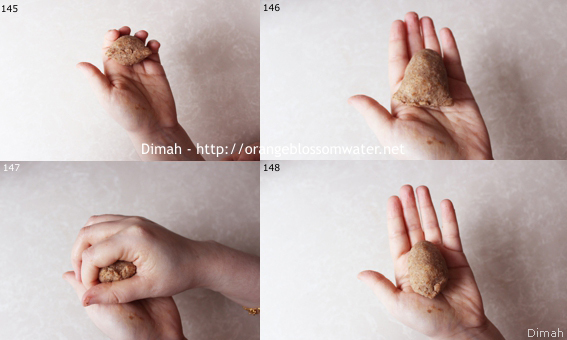 Take kibbeh ball, moistening your hands with water as you work. 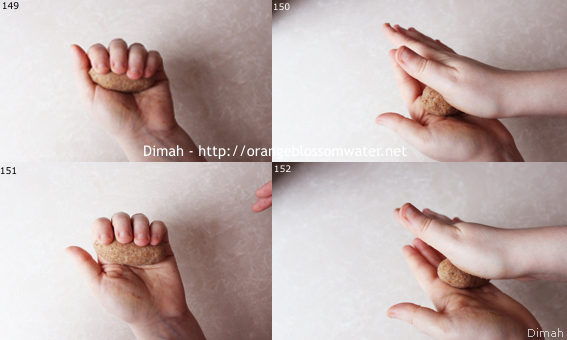 Roll the ball between your palms elongating it to form a 3 inch (7 cm) cylinder. Hold the cylinder in one hand and insert index finger of other hand into center to form a hole. Gradually enlarge the opening and shape into a thin-walled shell about 1/8 inch thick (0.3 cm). 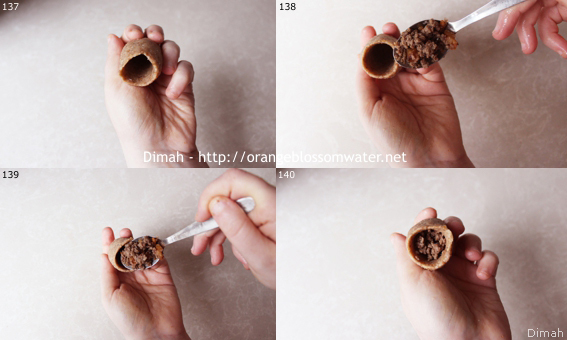 Mend any cracks in shell with a moistened finger. 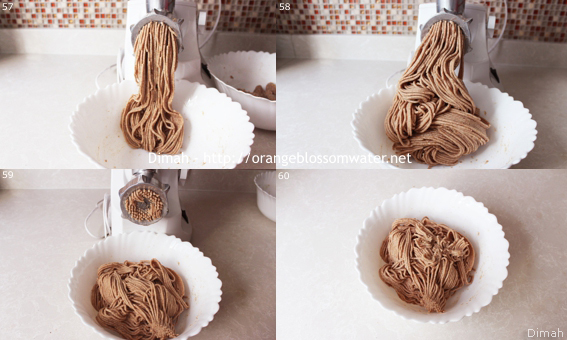 Once its right thickness, spoon in about a teaspoon of filling. It should be pretty full, but with enough room on top to close the opening. Press the filling with your finger. Moisten edges of opening. Bring the opening together at the top, making a point and seal the top. Roll between your palms to smooth it. 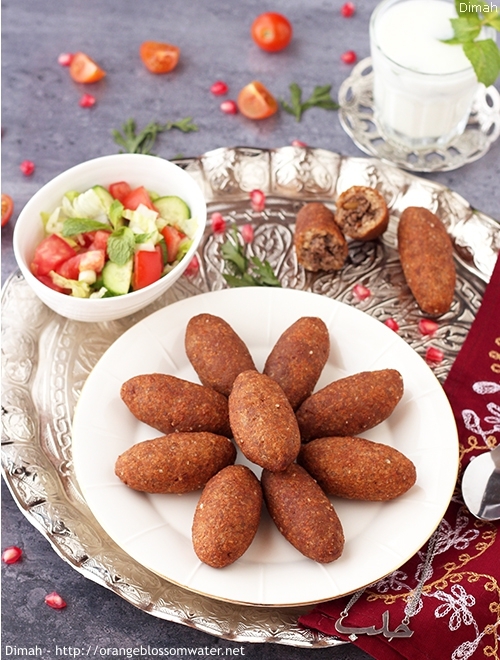 Put kibbeh on a plate, and always keep it covered with a damp cloth. 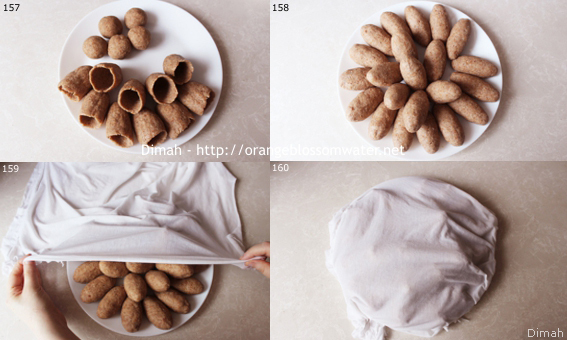 Keep Kibbeh covered with a damp cloth. Either you may fry it immediately or it can be kept in the refrigerator for a few hours but should be also kept covered with a damp cloth. 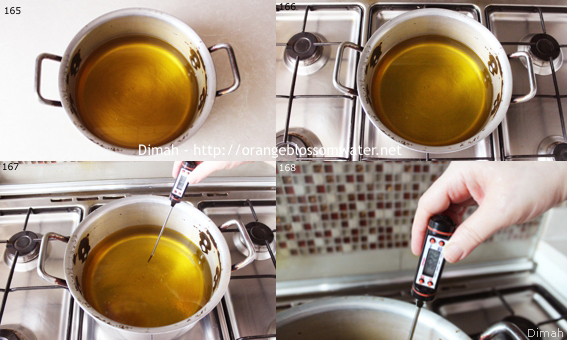 Fill a deep pot with a mixture of 1400 ml corn oil plus 200 ml olive oil. 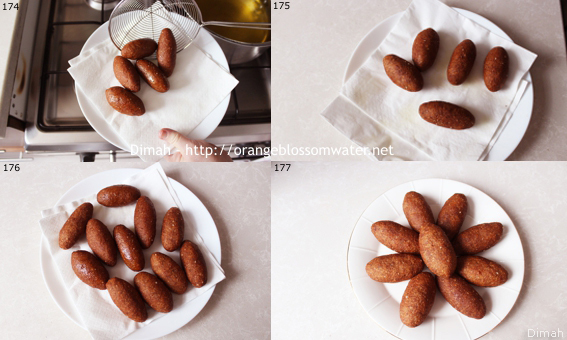 Fry kibbeh in batches. 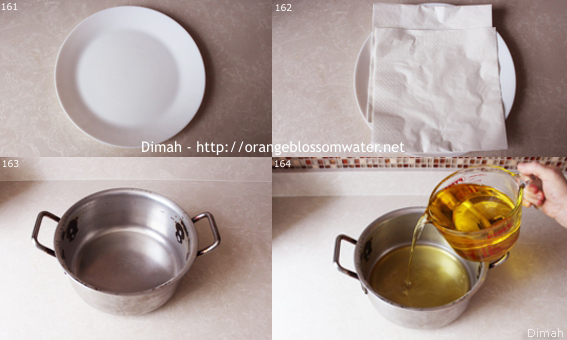 Turn occasionally when kibbeh start to float on the surface of the oil. Fry until the outer shell is dark golden brown and cooked through. 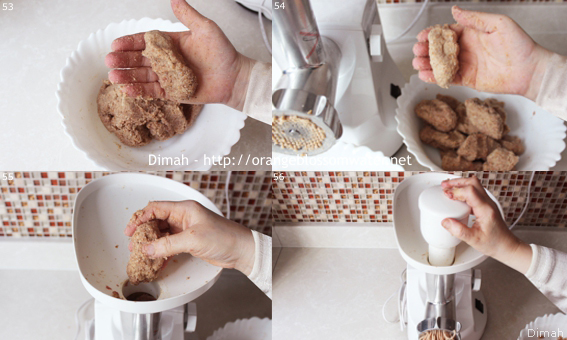 Drain fried kibbeh on paper towels. Transfer into a serving plate, and serve. 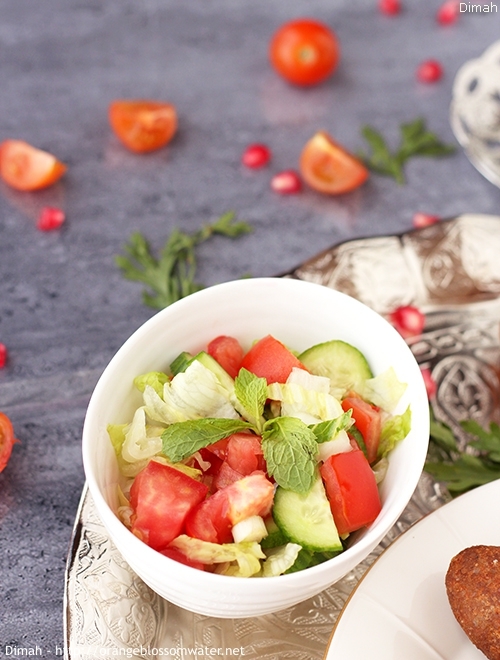 Serve kibbeh hot with salad (salad is prepared from tomato, cucumber, lettuce, mint, onion, lemon juice, olive oil and salt), and laban ‘ayran (yogurt diluted with water and seasoned with salt). 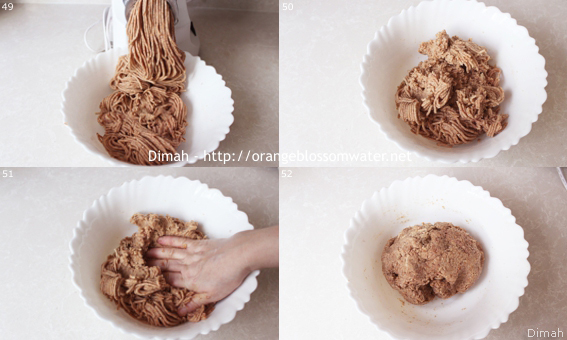 The name of brown bulgur in Aleppo is “Burghul ‘Omqi برغل عمقي”. Adding Al-Bhar Al-Halabi to “kibbeh dough” in the recipe of Kibbeh Meqliyeh (deep fried kibbeh) is optional, but of course it should be added to the filling. 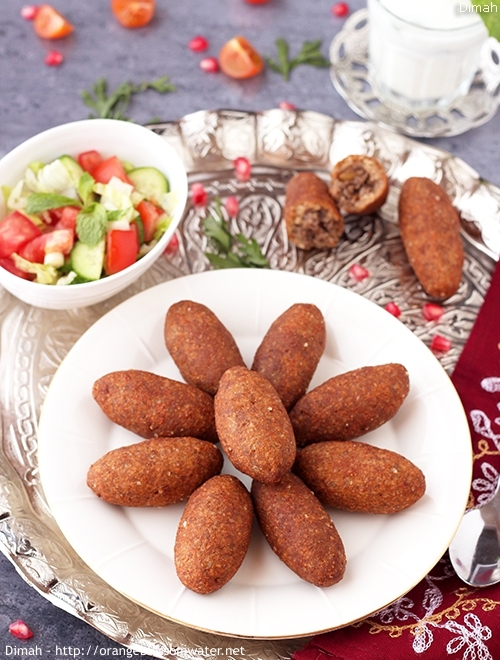 However, it is essential to add Al-Bhar Al-Halabi to kibbeh dough and to the filling in ther recipes such as Kibbeh Mabroumeh and Kibbeh Eswaret As-Set. 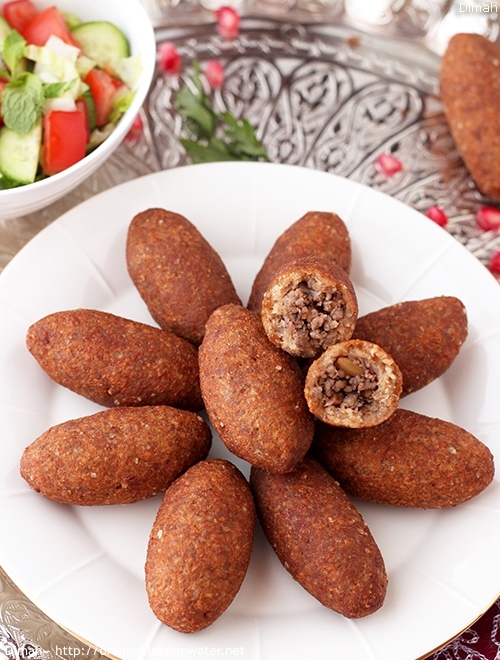 I got 22 pieces of kibbeh. This entry was posted on Saturday, August 5th, 2017 at 10:09 PM	and is filed under Syrian Cooking, To Aleppo With Love. You can follow any responses to this entry through the RSS 2.0 feed. You can skip to the end and leave a response. Pinging is currently not allowed.